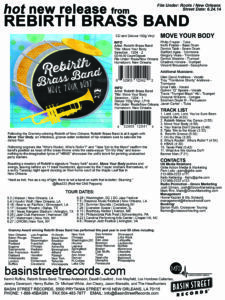 A New Release from Grammy Winning Rebirth Brass Band! On June 24th, 2014 Basin Street Records will release Move Your Body, the follow up to Rebirth Brass Band’s 2011 Grammy winning Rebirth of New Orleans. Get ready. This new album will be available on CD, deluxe 150g vinyl, and digital. At the same time, we will release the Grammy winning Rebirth of New Orleans album on deluxe 150g vinyl!